Bitcoin broke through $5k yesterday, triggering a sell-off across the Crypto market, taking September red after a green start to the month. We're too early in the month to draw any real conclusions but my portfolio has so far ridden this sell-off better than the market. With August performing so well, it had become difficult to provide any real insight into the market. It felt like every day I would list the coins going up, talk about the impending $5k Bitcoin and talk about my expectation that a correction is coming. The $5k Bitcoin event happened yesterday, triggering a market sell-off and an opportunity to start looking at potential scenarios and how I am going to trade them. The market reacted with a sell-off, but there is a potential that this is short term and another rally is yet to come. The timing of the $5k Bitcoin was not useful, happening early evening US time means that Asia was likely sleeping, Europe was preparing for bed and US traders were winding up their day. I expected a $5k Bitcoin to create waves across wider media but it has so far kept to Crypto and tech sources, and the market reacted with a sell-off across the board with only a few coins surviving unscathed. Short blip: this is a short blip with investors taking profit off the table. This would likely see a less than 20% drop in global market cap followed by a quick recovery. Correction signal: this is a warning sign that a correction is coming. This will be a 15% - 30% dip followed by a price rise and then another drop. Correction: we are at the start of a correction. This would be a drop of between 30% and 60% in many waves over the next few weeks. My feeling is that we are at number 2 and as such, I am going to prepare for a correction. I could be completely wrong here, this could just be a blip, and we will continue to make gains. My problem is that history has shown us that every time Crypto makes parabolic moves, a correction follows. My preference is, therefore, to take money off the table and miss out on potential gains than hold money in the game and make significant losses if a correction occurs. I think it will be important to wait out through the weekend and then the first couple of days of next week to see what is happening. I don't think weekend trading volumes are going to be high enough to find out where we are headed next. Wait and see what the market does until Monday / Tuesday. If the market recovers and the Global all time high is tested, I will be selling off assets so I hold +30% in fiat. I will also be trading volatile alts into stable tier 1 coins. If the market trades sideways/down. I will trade out on a daily basis those coins which make gains during the drop. If the market pukes into a full correction, I will react on a case by case basis but likely just have to accept the correction. 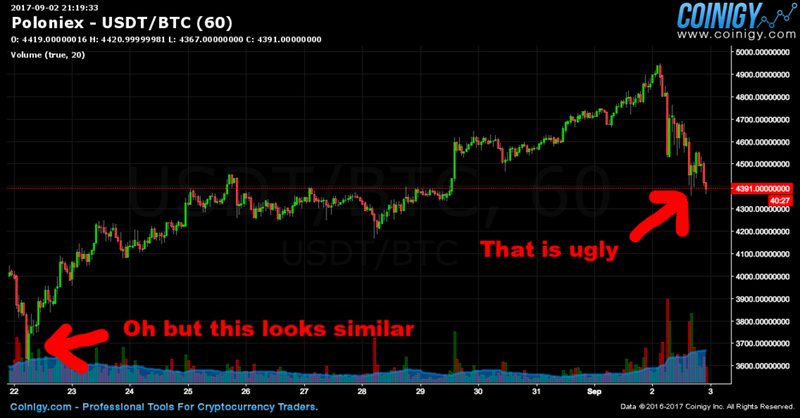 The reason I won't trade out of this scenario is I won't know where the bottom is. This is how I played the June/July correction. There is every chance that if I start selling off into fiat and stable alts that the market recovers and there is no correction. At this point, I am left with the feeling of "if only I had held." I am more than comfortable with this. I would rather take money off the table and miss gains than leave money on the table and make losses. Seeing a nice fiat profit is always good, and I will still have a 70% play in the market anyway. Gains for the year have been great, and I feel no need to get greedy. I received an email from someone I connected to on LinkedIn, an old client, telling me how they have been using the blog as guidance and entered the market for the first time yesterday. Sadly their first experience will be a price crash, and their portfolio will immediately be in negative. If you are in this position and worrying, I just want to point a couple of things out. Secondly, big red days can feel scary. Watching the price make waves down in double digit percentages can lead to impulsive decisions, please be patient and look at the following charts for perspective. Price movements can look scary. You can see this is not so bad. You can see that actually movements like this are regular. You can see that corrections happen all the time. Markets never move up in a straight line. The history of Bitcoin is littered with market crashes and corrections. If you have bought in at the peak, Bitcoin crashes, and you never make a profit then I am sorry, you are just super unlucky. Do I think this is what will happen? Nope. We are just moving up too fast, and this isn't sustainable. There will never be enough buyers to maintain this level of growth. We need price corrections for the market to settle down and establish a correct price for demand. Parabolic spikes are always speculative, and there are whales in the market who are taking profit off the table all the time. So, let's ride the weekend out, see how trading is on Monday and Tuesday and make an assessment of where the market is. It may be a blip, it may be another correction like June/July, and it may be something bigger. Personally, I don't think Crypto is dying, I just think profit is being taken by big players and panic sellers are, well, panicking. I'll adjust my strategy when I know exactly where we are at. Any questions, then please do ask.